1. Hi Adam, thanks for agreeing to conduct this interview. Please introduce yourself to my readers, and be sure to include your best feats as a grip specialist. Bret thanks for the interview. I am 29 and live in Minneapolis MN. I have been training grip in some capacity for over 6 years now, with the last 3 being specific to the sport lifts. My best lifts have been a 251.25 two hands pinch in competition (world record for the 105 & 120 kg class), 105 lbs one hand pinch (world record 105-120+ kg), 2” vertical bar 340 in competition (world record 105-120+ kg), an 870 lbs three-lift grip total for the 2012 season (3rd highest ever in competition/lowest body weight for an 800+ total in world). I have an additional 9 world records on various lifts. A few others worth noting – Double Inch farmers walk for 48 ft. Being able to toss the inch dumbbell from one hand and catch it in the other. Doing pinch grip pull ups, from levers, and straight leg raises, 585 lbs one hand barbell deadlift, strictly curling 45 lbs Olympic plates by pinching the rim, and lifting over 1,000 lbs with the eagle loop finger rings. 2. I learned a ton about grip training when I watched your new DVD. I couldn’t believe all of the little nuances and tricks of the trade inherent to the sport. Where does the common guy go wrong when it comes to grip training? The number one error is ignoring grip training. It is pretty rare for most men to do any specific grip work in their training. The common idea most have is that by doing barbell deads/rows/pull ups their hands are getting plenty of work. I would compare this to someone who only does the bench press for his upper body while ignoring overhead and rowing motions. Certainly doing that one motion is productive, but there are many ranges of motion that are not trained that way. Look at your hand for a moment. Move your fingers and thumb around. Move your wrist around. See all of the distinct motions present? Take any person and make their hands even 15% stronger and we see a much larger output of strength from them. The hands are always the limiting factor in strength. The second most common error is ignoring the thumb. Some people will go on and incorporate thick grips or torsion spring grippers to their training, but neither one of these address the motions of the thumb. If you would only agree to train one aspect of hand strength, make it some kind of pinch training for the highest pay off. The third most common error is thinking that all of the rules of training change when you go south of the elbow. What needs to happen in order for any given body part to be improved? We know there must be overload, there must be a minimal effective amount of volume, and greater frequency of these two tends to speed that up. With this said, some people do some downright strange things attempting to train their grip; only doing singles, others only doing very high reps. Some only train it once every 10-15 days, other trying to train it every day. In terms of concepts of training, programming for the hands is no different than legs, back, shoulders, or abs. Pardon to those now who think all of those are highly different. They are not. 3. 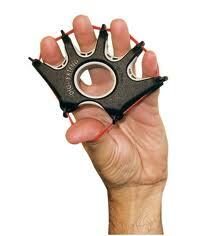 How many different categories of grip/hand/forearm strength are there? Open hand grip, such as fatbars and thick handled objects. Levering, typically using the wrist along with a closed hand position. Bending, a combination of holding strength with the hands and stabilization at the wrist while moving the upper body. Tearing motions, using the fingers, thumb and wrist often in circular motions such as card tearing and shredding phone books. Extension of the fingers and hand, primarily as opposition to work in flexion. Wrist movements including flexion/extension and ulnar/radial deviation motions. Most people get adequate flexion and extension training with their pressing, pulls, and curl motions. 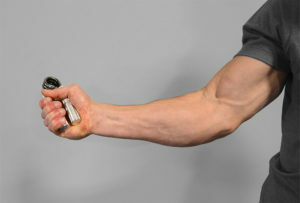 Wrist deviation motions can be a useful addition for those who do not work with levering or neutral grip apparatuses. That may look like a huge list, but it is no bigger than the various motions we could describe found in the back or the hip. The good news is most of these motions are trained in very large full body patterns. Grip training does not automatically mean doing a lot of little isolation movements. The opposite is true, the prime grip motions are all very large movements using a lot of resistance – various deadlifts, pull ups, bending steel, snatches, cleans, rotational patterns, even some pressing. 4. I know that many people use rubber bands to train finger extension, as an opposition movement to other grip work. What are your thoughts on this practice? Most people think about training extension as either an isolated movement or opening/spreading the fingers. Sometimes things that are logical are not physiological. In my experience, and having worked with many grip athletes, I believe the common rubber band approach to opening the hand is at best a minimal pay off movement, and at worst can be dangerous. The number one movement to safely train the hand in opposition to other grip work will be a very thin pinch grip motion, and levers such as plate curls. The extensors function more in a static role than as a highly loaded dynamic mover. Much like the Crocodile, our hands are built to forcefully close under potentially huge load, but not designed to open against it. We simply have poor leverage for it. The compression loading of the fingers is not “pure extension” as some have billed it in broscience and martial arts texts. When we look at the legs or the back, we see a number of smaller muscles that could be trained in isolation, but it works better to train larger movements. Training the extensor tissues is simply higher pay off and much safer using a thin grip pinch. The other technique that is more specialized is slowly opening of the hand against a torsion spring gripper. Not to be confused with negatives training, doing essentially an eccentric with grippers addresses the hand tissue in the extension pattern. 5. Are there any extreme practices that grip specialists are using that you do not approve of? There are two specific practices used commonly in the grip community that I personally do not use or teach and advise against. The first is the use of negatives with crush grip training. What I mean is this – people are taking very high resistance torsion spring grippers, forcing them closed and trying to hold them closed while their hand is ripped open. I would compare this to someone who is attempting to up their back squat, and the plan is to get mushed under 100 + more lbs than they can safely squat. This is one of the number one injuries in advanced grip specialists yet they keep doing it. The most recent example brought to my attention was when one of the very top European crush grip specialist severely damaged his hand tendons doing this. This man was able to close a Captain of Crush #4 gripper fairly easily, and right now he is having hand pain working with a COC #2. To compare that to something like deadlifting – imagine if a 800 lbs puller told you he was missing reps with 315 because of pain. Negatives against a torsion spring are going to hurt you, and the stronger you are the worse the injury will be when it happens. The second is a heavy dependence on isometrics in the bending positions. This trend began with bad marketing and from the success of a few freak show strong guys. Everyone has read this and heard this before – what works for Jake may not work for Joe. I have worked with a number of men who did fairly severe damage to their wrist doing isometric holds and pulls. During a normal lift, you have a variety of cues that will indicate it is time to stop. These cues are not as obvious during isometric movements. Some people are dumb, and will not listen to their body when they experience pain. The price they pay is months off, sometimes years off from ligament injury. You may not be that strong, but you are certainly strong enough to break yourself. 6. Thank you very much for your time Adam. Last question. How does someone like me blend the different types of hand strength into his training without compromising the rest of his training and overdoing things (someone who already performs deadlifts, chins, rows, and db work)? The starting point is to add in some pinch grip work and thick bar to your current favorite lifts. Have one day where you swap to a fat bar for your prime working sets on pull ups, rows, deads. Have a second day where you do specific pinch work at the beginning or end of your workout. This modest change will produce measurable progress in just a few weeks. Throw in some plate curls, some challenge bell lifts, and some bear hug lifts and you will have FAR stronger hands 3 months from now. My goal is not to convert every person I meet to a grip athlete, my goal is to get men back to having a man’s handshake and remove grip as their limiting factor. This summer I competed at the San Jose FitExpo Ironmind grip record breaker. As the lightest man there, I outlifted 300+ men in the grip events. After the competition, Dr. Strossen set up his “Crushed to Dust” challenge which is a 45 lbs hub lift, a 200 lbs rolling thunder lift, and a #2 captain of crush. I demonstrated the events to a number of body builders and mixed martial artists there. NOT ONE PERSON could do it. Quite a few 260lb body builders had to own up to having weak wrists that day. It doesn’t have to be like that bro. Adam T. Glass is a world class grip athlete and heads training at The Movement Minneapolis. He keeps a blog and training log at http://www.adamtglass.com/ and recently released a comprehensive grip training DVD titled Industrial Strength Grip (not an affiliate link). The weights mentioned in the beginning, are those without a specified unit all in pounds? Great interview Bret and awesome info by Adam as always. I’ve had the luxury of knowing Adam for several years now and working directly with him once he moved down to MN. To say my grip was weak when I asked for his help was an understatement. My wife recently (without any direct grip training) easily lifted my opening weight for the first grip competition I did about 3 years ago just the other day. Now my grip is much better and not nearly as limiting either; and my other lifts have gone up too. The good part is that as Adam stated, with just a few minutes of practice on most days you can be much much stronger overall. Many clients I have seen have had some pain related to a loss of basic grip functions too. I owe Adam for sharing all his great grip knowledge with me so that I am better now–much appreciated! Awesome interview! Adam is more than just a grip guy. As you can tell, he’s a very talented trainer too. He’s personally helped me for the last few years and grip strength is only a small portion of what he has helped me with. Glad to see someone taking the lead on this. Great post. Oh, and those lifts are all in lbs. My question relates to rock climbing, which is obviously a highly grip-dependent sport. The inherited wisdom of rock climbing along the lines of grip strength is that muscle trains “quickly” and ligament “trains slowly”, meaning you can train up the muscle fibers around gripping over the course of weeks or monnths, but your ligaments respond to this kind of stress only over the course of years. What do you guys make of this model? I haven’t been able to confirm or refute this received wisdom, and — being a “beginning intermediate” climber — would love to know whether it makes any sense… and how to train for various rock climbing grips in light of whether the received wisdom is true or not. I am not Bret, so I look forward to his thoughts, but my thoughts are it is kind of right. I don’t think the time period for ligaments is that long though, nor is the muscle changes that fast. In the end, you can’t completely separate them apart anyway, so just train. The nervous system in untrained people will respond faster than the muscles though. and he goes further to say that using bands for finger extensions is at worst dangerous. 1) I was disappointed that he didn’t cite a reference for his claim that rubber band extensions could be dangerous. I know of no known examples/cases of this. one can use a thin pinch to train them. Well, this is where his understanding of functional anatomy goes wrong. an isometric hold the direction of force initially is finger flexion. The muscles involved are the thenar eminnence, adductor pollicis, the interossei, and the extrensic flexors. The lumbracales are involved as well. directly involved except for passive opposition to the flexors involved. This is only because of the neutral position of the wrist but with some athletes the wrists are flexed a few degrees. As wrist flexion increases the extensors become less involved and at full wrist flexion they are basically relaxed (reciprocal inhibition). Conclusion, I see only benefits from including extensor work with bands for rehab, prehab, and balance in any athletes grip training. I’ve seen nor reviewed any evidence of danger from performing these movements. Lastly, thin pinch (from an anatomical perspective) does not involve the active use of the extensors in question to train them sufficiently in any form. Many people claim that fat grips train the extensors, too…it never made sense to me, but is there any truth to it? Sven, it’s the movement you perform that determines if you’re working the extensors, not the piece of equipment you have in your hand(s). For example, if you perform DL’s with Fat Grips you’re not training the extensors, but if you place the Fat Grips on a straight barbell and perform seated wrist extensions you’d be training the extensors. Yes, sure. But many people argue that just grabbing something with a fat grip will work the extensors, much like the claim that training pinch grip does.